What fun ideas, Anne! Thanks for sharing :) I love how you incorporated the math concepts into it - fun and educational at the same time. Defintiely storing this away for the beginning of next year - my kiddos will love it! How cute and fun! I will have to try this next year! Your kids will remember you always because you make learning fun! Hang in there! 10 more to go! SO glad you had fun with the games! I love how you used the actual videos and math as instruction! Great ideas!!! 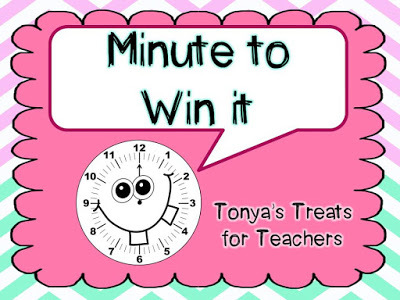 I LOVE Minute to Win It! I totally forgot about playing it this year! I made a whole tub full of all the materials needed to play several different games-my husband even borrowed it to bring to work to motivate his employees! :) Of course, you're a better teacher than me incorporating math! You're amazing, and I'm sure your school will feel a huge void without you, but they will be happy for your new endeavor! Thanks for sharing and linking up BBB! WHY? Why did you post this after I am already finished? I almost...ALMOST...want to fly home and play this with my kiddos in my class....except it's summer and I'm lazy and I don't want to do anything except be a blob. I love that you were doing math with your kids and your principal walked in. My Admin would love that! I know you are going to miss your old school, but I'm super excited for your new adventures!!! I love how you showed your students that math is everywhere! Good luck for your last 10 days. You can do it! !